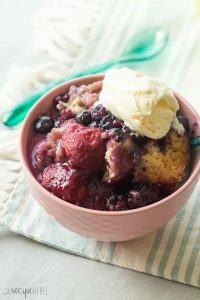 This Slow Cooker Berry Cobbler is a super simple dessert packed with strawberries and blueberries (fresh or frozen!) and is perfect for summer or winter! Slow cooker desserts are pretty much the best thing ever. I mean, slow cooker recipes in general are pretty much the best thing ever, so… yeah. 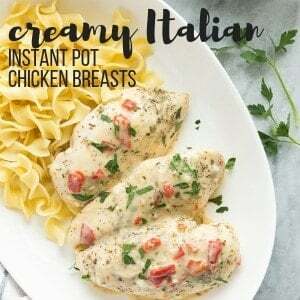 I was so excited to try this recipe when I found it. I found it in a Comfort Food Diet cookbook from Taste of Home, which I bought because, well, isn’t that the dream? To eat cozy comfort food and desserts and still be somewhat healthy? As much as I love a good chocolate/caramel/Nutella/peanut butter dessert, a dessert loaded with fresh fruit is always going to be better for you! Berries pack such a nutritional punch, and what’s great is that you can use frozen berries in the winter (when we’re allllll about warm cozy desserts) and fresh berries in the summer (when you don’t want to heat up the house with the oven). *Note: Because sometimes (okay, often) I’m terrible at reading recipe instructions, I threw my berries in frozen instead of thawing them as the original recipe calls for. It works, just requires a little extra cook time. Use fresh or thawed berries for faster cook time. For the batter, In a large bowl, combine the 1 cup flour, 2 tablespoons sugar, baking powder and cinnamon. Stir in egg, milk and canola oil until combined -- batter will be thick. Lightly grease a 4-5 quart slow cooker and spread batter in the bottom. In another large bowl, combine ¼ cup flour and 1 cup sugar. 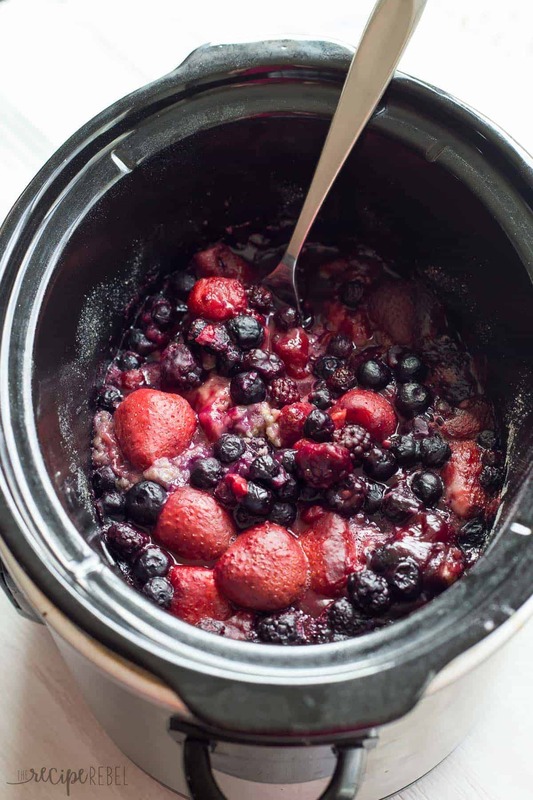 Stir in berries and spread over top the batter in the slow cooker. Cover and cook on high for 2-3 hours (closer to 2 hours for fresh or thawed berries, closer to 3 hours for frozen berries). Serve warm with a dollop of ice cream! For the batter, In a large bowl, combine the 1 cup flour, 2 tablespoons sugar, baking powder and cinnamon. Stir in egg, milk and canola oil until combined — batter will be thick. In another large bowl, combine 1/4 cup flour and 1 cup sugar. Stir in berries and spread over top the batter in the slow cooker. More Slow Cooker Cobbler recipes! « Skillet Philly Cheesesteak Potato Wedges and a GIVEAWAY! I know this is very random..I’m good friends with a gal in Washington..same last name as yours. Never seen another Fehr in phone books. I’m making a double batch of berry cobbler today from your recipe which is how I came across your name. Thanks for the recipe too. Having a dinner party next week. This looks amazing. Can’t wait to try it. This looks delicious! Have you ever tried making it with whole wheat flour? I haven’t but I think it would work just fine! Do you think it would work to double the recipe in a 5 quart crock pot? I haven’t ever tried doubling it, so I’m not totally sure. My only concern would be that it would have to cook longer so that the cake in the bottom was completely cooked through, so hopefully the bottom wouldn’t get too dark. I think it’s worth a shot! I’d love to hear how it works if you try it! I simply doubled the ingredients , using frozen berries. And cooked it for 3 hours per directions. Turned out perfectly! Do think it would work to double the recipe using a 5 quart crock pot? I’ve got mine in the cooker as we speak. Can’t wait to try it! Has anyone made it with less sugar? Let me know how it turns out! I’ve never tried with less sugar, though you could reduce the sugar in the berries without affecting the recipe much (aside from the sweetness). Berry desserts with vanilla ice cream are my favorite things ever this time of year!! I just want a huge bowl of this right now! And I’m thinking that in a few months I will not want to turn my oven on at all, so a slow cooker dessert would be so nice! Yes, berries and ice cream is the BEST in the summer! I’m honestly surprised this cobbler has no butter in it. It looks so indulgent, and I’m all about the slow cooker in the summer months! I totally need to make dessert in my slow-cooker more often! This cobbler will be SO great in the summer when it’s like 100 degrees in my kitchen and I don’t feel like turning on my oven! Totally! I am so looking forward to those days! The comfort food diet, lol! Sounds like my kind of diet!! 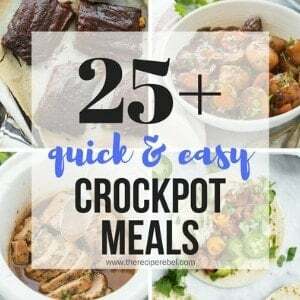 I love using the crock pot especially as it gets warmer outside. This cobbler is definitely going to have to happen! Pinned! Lol! Right?? It’s the best way to diet! Thanks Malinda! Ashley, I love that you made dessert in your slow cooker. . saving this one!! totally going to try! love and looks so good! Thanks Alice! It’s one of my favorite things! 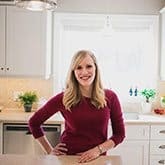 I love all of your slow cooker recipes! 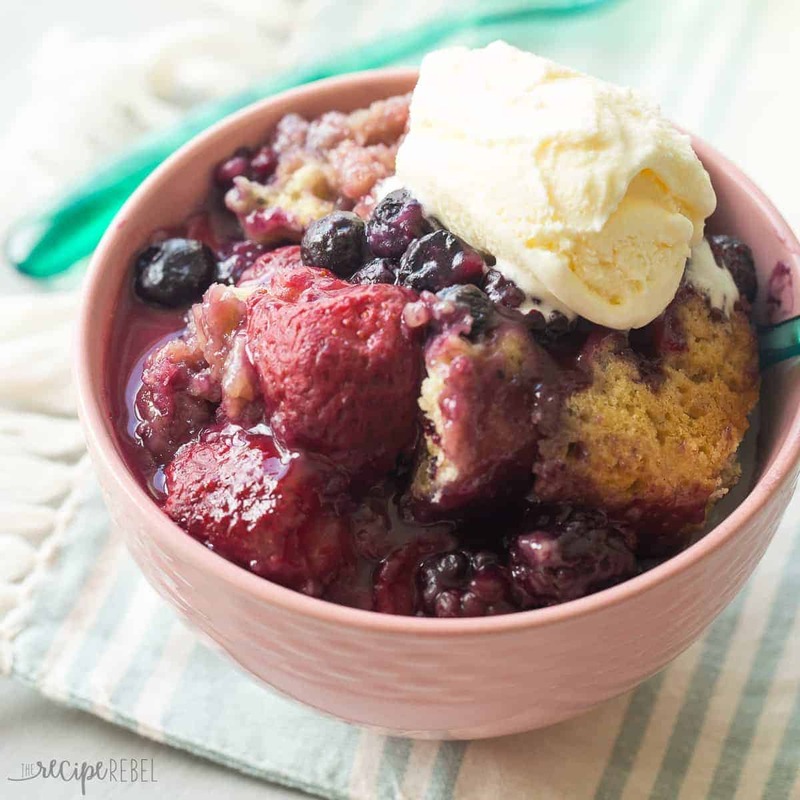 This cobbler is so perfect for the warm weather that’s ahead! Thanks Jessica! I am totally obsessed with it! OMG yaaaas I have never made slow cooker cobbler but I need to get going on that – I love how easy it is to just throw together, set and forget. Need a big bowl of this with ice cream! That is the only way to do it! Thanks Rachel! Hi Ashley! I just made a mixed berry cobbler day before yesterday! I used frozen berries because even though berries are in the stores, they are terribly expensive and who knows where they come from! 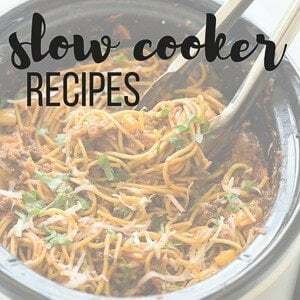 I will be trying this slow cooker version next! This looks amazing! Of course anything in the Crock Pot is in my opinion! Right?! I can’t get enough of it! The comfort food diet?! Now THAT is a diet I can get behind, since I’m 100% against dieting. I just can’t restrict myself from all the delicious things in life… so that type of diet has my name written all over it! And so does this slow cooker cobbler! Can you believe I have NEVER made a dessert in the slow cooker! I know – whaaaa? I need to fix that. Pronto. And starting with this! Love love loooooove this cobbler, girlfriend! Looks seriously delicious and I’m loving all that fruit! Gimme! Pinned! Cheers, sweets! Seriously, I have only made a handful of desserts in my slow cooker but it’s so perfect for those warm, melty-ice-cream types! (The best, obviously!). And yeah — that’s about the only kind of diet I can handle! LOl. I have yet to make a cobbler in the slow cooker. I don’t know what’s holding me back. It sounds like the best idea ever!! Your berry version looks delicious! Thanks Jen! This was my first experiment with it! I agree, slow cooker desserts are the best! I’ve only made one dessert in my slow cooker before, so I definitely need to change that. I absolutely love the idea of making cobbler in there! So perfect for the summer because then you don’t have to heat your house up! Wishing I had this for breakfast! Yes! So much better than turning on the oven! Thanks Gayle!